"We read into things, therefore we are human?" we wrote in the comments to Dan Riehl's "The New Missile Defense Agency Logo Looks Familiar." It seems folks are getting all in a tizzy about the logo's resemblance to both the Obama 2008 icon and the Muslim crescent and star. The hysteria over the unfortunately named 'Crescent of Embrace' design for the Flight 93 Memorial design (above) came to mind. Much the same could be said of how Scott Brown supporters are reacting to his young voting record (see below). Literally overnight, the fledgling Republican senator who ended Democrats' filibuster-proof majority by winning a special election in Massachusetts has gone from being the darling of America's conservative activists to being their goat. Monday night, Brown announced that he would join four other Republicans in voting to block a GOP filibuster and move forward with a $15-billion jobs bill designed by Senate Majority Leader Harry Reid (D-Nev.). Almost immediately, the political blogosphere exploded. THE ANCHORESS IS GLAD SCOTT BROWN IS VOTING FOR THE WATERED-DOWN JOBS BILL, says it wrecks the “party of No” and “broken government” narratives at comparatively low cost. Sissy Willis, a tea party blogger from Chelsea, Mass., who supported Brown's candidacy, said many of her compatriots in the nascent anti-big-government movement were "overreacting. ""They expected him to be a conservative when he's always been an independent," Willis said. "He's representing his constituents," she said. Willis said she expected Brown to follow through on trying to block the Democrats' healthcare plan, a signature issue of his campaign. She compared the mania over Brown to that which surrounded President Obama's campaign, saying that with both, there was an inevitable letdown. Supporters "weren't using their brains, they were using their hearts," she said. "When he didn't turn out to change the world, they felt betrayed." Inoculated by his canny jobs-bill vote yesterday, Scott Brown "rejects Obamacare II as ‘nuclear option’ that will increase taxes." Related: Professor Jacobson of Legal Insurrection offers a most concise, terse, pithy explication of the nightmare that is Obamacare 2.0 in his must-read "Now Is Not The time For Weakness. This just in (via Norsu on Twitter): Scott Brown in his own words on Howie Carr's Boston radio talk show. Republication from our "Crescent of Embrace" post "Reading the landscape" of September 2005: The Three Soldiers (right) by Frederick Hart caught us off guard two falls ago when we walked up the rise after taking in Maya Lyn's once controversial but now much loved polished marble Vietnam Veterans' Memorial Wall on the Mall in D.C., engraved with all the names of the war dead (left). Overcome with emotion as we followed the three soldiers' gaze back to the wall, we recalled our elitist disdain from years before when we first heard that the pristine wall would be "contaminated" by a realistic grouping. How wrong we were. The lifelike but universal soldiers breathe life into the cool, abstract wall with their humanity, and the wall, in turn, lends historical resonance to the immediacy and concreteness of the soldiers. The whole, never anticipated by individual planners nor artists, was so much greater than the sum of its parts. Landscapes are like that. Their evocative power grows over time. A true Flight 93 memorial would honor courage, action and improvisation, but reflection, healing and wetlands are the best we can manage. Go to any Civil War memorial on any New England common, and marvel at how they managed to honor their dead without wetlands and wind chimes. We've never visited Gettysburg National Military Park. According to the NPS website, it "incorporates nearly 6,000 acres, with 26 miles of park roads and over 1,400 monuments, markers, and memorials." But in our mind's eye it is not the touchingly sentimental, old-fashioned memorials so much as the evocative and timeless landscape itself -- the "passive beauty," in Lileks's words, of its vast, empty battlefields -- that moves us to contemplate the human condition. Again to borrow Lileks's words, these "muted things" do not seem "at odds with the events they describe." Are Mark Steyn & Company blinded by an agenda they signed up for in the wake of Shanksville street evangelist Ron McRae's initial sighting of the virgin the Islamic crescent and star in the site plan for the Flight 93 memorial? Have they strayed so far from their roots that they have forgotten Thoreau's insight that "The most alive is the wildest. Not yet subdued to man, its presence refreshes him." A proper war memorial stirs to anger and action . . .
Memorial architect Paul Murdoch, whose firm emphasizes "environmental responsibility and sustainability," did not return calls and e-mails seeking comment, but he did emphasize to the Pittsburgh Post-Gazette that his creation was about "healing" and "contemplation." He is also proud of his idea to hang a bunch of wind chimes in a tall tower at the site as a "gesture of healing and bonding." I continue to think you're reading all the wrong things into the Shanksville design. As a landscape architect myself, I tend to bypass the bloated prose of architects to look at the work itself and try to imagine myself in the space. If a landscape architect blogs in the 'sphere and no one is around to hear, does it make a sound? Update: A way-cool blog we discovered in our Site Meter stats, Archinect links. "Where some see crescents, others see apple pie," we wrote mid September last year as a tide of righteous indignation coming from our friends in the right blogosphere drowned out our tiny voice in the wilderness: "Look, Ma. Our first animated GIF! Inspired by the one by Zombie at Michelle Malkin's, where the Flight 93 memorial's curved grove of red maples and sugar maples becomes an Islamic crescent, we created our own version, where the curve becomes the edge of an All-American apple pie. As Mom said, patting out the dough onto her floured board, Let's roll! 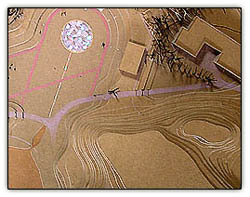 (Detail of Flight 93 memorial site plan showing the Bowl or Crescent of Embrace in red. Pie photo from 'Put the pie together.')" First it was Michelle Malkin, Charles Johnson of Little Green Footballs, Scott Johnson of PowerLine and other leading lights of the right blogosphere who started seeing things we didn't in the design for the Flight 93 Memorial. We took a deep breath, blogged forward against the tide and got a nod -- and a few nice links -- from Michelle and Scott. But now the earth is falling away beneath our feet. Mark Steyn himself (left, C-Span archives) has partaken of the Kool Aid being served up by "self-proclaimed bishop Ron McRae (right), a street evangelist based in Shanksville's Somerset County," and other seers who have vowed to fight the "Crescent of Embrace" to the death, according to the Pittsburgh Post-Gazette. This evening the WaPo is reporting that Rep. Tom Tancredo (R. CO) has jumped into the fray. This may be the last chance to stop one of the most inappropriate 9/11 memorials imaginable. But it was a rude awakening in the last week to see respected opinion shapers from the right side of the aisle resorting to the same tactics without bothering to get their facts straight. A cursory glance at an architect's plan isn't going to do it. As the widow of Flight 93's pilot, Sandy Dahl, put it, "No one was thinking of Islam when they were making this memorial." "Red-maple baiting catches fire," we titled a post where we noted that "Semicircular forms -- like the amphitheatre (upper left) in this chipboard topographical model of a design project from our student days at Harvard Design School, are standard archetypal tools of the landscape architect's trade. But in today's fevered climate of seeing witches behind every tree, the use of such forms can get your plantings -- specifically red maples -- metaphorically burned at the stake." [We] were touched by the sentiments of one of our visitors, jegoing, who observed rather quizzically "I thought this site was slanted toward the conservative side?" Yes, but it's not an echo chamber. Besides, whom do you believe, conspiratory seers or your eyes? 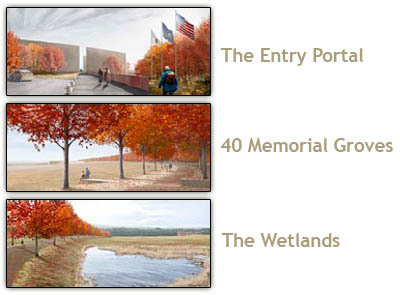 The redesign of architect Paul Murdoch's controversial Flight 93 National Memorial "features most of the details of the original" (middle and bottom images above are identical to drawings unveiled last September), "but a round, bowl-shaped area would replace a 'Crescent of Embrace,' a crescent-shaped cluster of maple trees," AP inaccurately reports. The bowl-shaped area is, in fact, the existing lay of the land. The "cluster of maple trees" planted along the rim of the bowl is a monumental grove of Red and Sugar Maples that would provide a sheltering promenade overlooking the sacred spot at the edge of the field below, where the hijacked plane crashed. We blogged here extensively on the topic, a voice in the wilderness of fellow bloggers of the right who saw cryptic symbols of dhimmitude where we -- donning our landscape architectural hat -- saw a curved allée of native tree species. The redesign extends the "crescent" into a rough circle, but some mad dogs are still howling. To understand a landscape, you have to inhabit the site, if not in person, at least with your mind's eye. A cursory glance at an architect's plan isn't going to do it. As the widow of Flight 93's pilot, Sandy Dahl, put it, "No one was thinking of Islam when they were making this memorial. 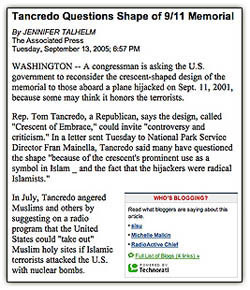 I would love for Mr. Tancredo [R-CO who criticized the design in a letter to the National Park Service Director] to visit the site and not look at an aerial photo of it." The redesigned flight 93 memorial, announced today, still contains all of the features that made it a terrorist memorial. Architect Paul Murdoch's infamous red crescent is still there, still planted with red maple trees, still inscribed in the exact same circle as before, and with the same two crescent tips still intact. Thus the crescent bisector defined by these crescent tips is also the same as before. It still points almost exactly to Mecca, making the crescent a Mihrab (an Islamic prayer station, where the believer faces into a crescent, towards Mecca, to perform his ritual prostrations). You see what you want to see, we guess, but what's this "points almost exactly to Mecca"? Does it point to Mecca, or doesn't it? In fact, the so-called "crescent tips" were sited as they were -- at the northwestern and southeastern ends of the site -- not because of some secret alignment at right angles to an invisible line pointing towards Mecca but because these points marked the intersection of the arc of trees with the flight path and with the edge of the "sacred ground" itself where the plane crashed. 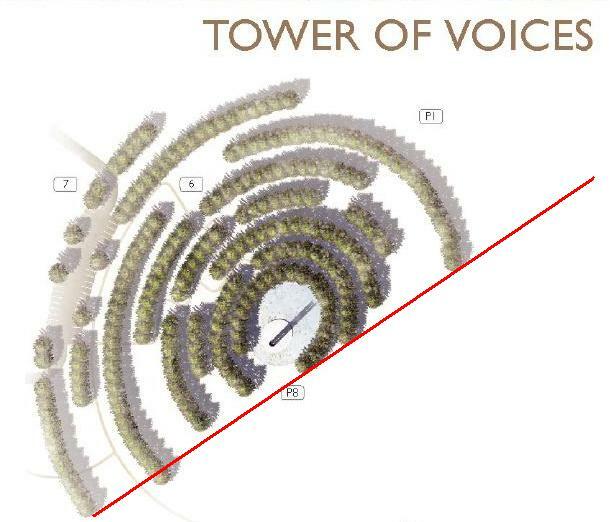 "Crescent array surrounds Tower of Voices. Line across crescent tips points almost precisely to Mecca," writes Alec Rawls. Yah, so? It would be pretty constricting if landscape architects had to avoid any possible reference to particular points of the compass in order to avoid offending certain people. In a reverse sense, it reminds us of the holiday-that-dare-not-speak-its-name phobia that's been gripping the nation of late. 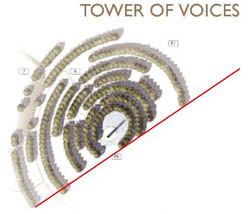 The logic of Rawls's argument above -- that the "infamous red crescent" formed by the maple grove is a crypto-Mihrab signaling the faithful to face into it towards Mecca -- calls into question the relevance of an imaginary red line across the "crescent tips" of the rows of trees surrounding the Tower of Voices. Were we to enter this "crescent" -- we would call it an arc -- we would be facing a compass point at approximately right angles to the direction of Mecca. Is Mr. Rawls trying to have it both ways? But more importantly, why are serious thinkers and opinion shapers on the right side of the blogosphere following him down this rabbit hole again? I've always thought the Flight 93 Memorial looked a lot better than what the conspiracy hysterics thought they saw in their feverish visions. Here's the final version. No more "arcs." I'll probably try to visit in the fall, when the maples will be on fire. I expect it will be quite beautiful. I’ve been part of teams designing tall high-rises with multiple uses and amazing structural and mechanical systems . . . It’s for that reason the unveiling for the design of memorials does little to engage my interest . . . The most highly revered architects in history are never associated with memorials. We don’t study memorials much in architecture school, probably because it’s less about making buildings than it is glorified landscape architecture. 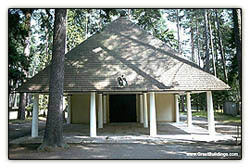 "It is subordinate already -- to the woods," said Gunnar Asplund of his Woodland Chapel at Woodland Cemetery in Stockholm. "The situation did not permit a building volume large enough to stand out monumentally against the natural setting. And so -- for the avoidance of half-measures -- the building was compressed until it modestly subordinated itself, insinuated itself into the woods, surrounded by spruce and pine trees towering to double its own height." Ahem. Glorified landscape architecture indeed. Whatever the title on their shingle, some of the most highly revered designers are, indeed, associated with memorial design. Still, as a veteran of the Harvard Design School's Department of Landscape Architecture, we can vouch for the "embarrassing levels of schmaltziness" to which designers are prone in presenting their work to the public, and we suspect architect Paul Murdoch's choice of the widely misinterpreted title "Crescent of Embrace" for the curved allee of maples at the heart of the Flight 93 Memorial was just another example of flighty prose. 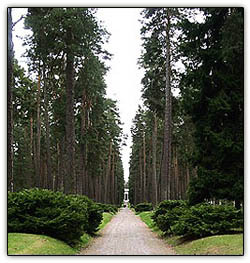 At the end of an allee of ancient spruce and pines cut through the forest at Stockholm's Woodland Cemetery lies the Chapel of Resurrection by S. Lewerentz. To understand a landscape, you have to inhabit the site, if not in person, at least with your mind's eye. A cursory glance at an architect's plan isn't going to do it. As the widow of Flight 93's pilot, Sandy Dahl, put it, "No one was thinking of Islam when they were making this memorial. I would love for Mr. Tancredo to visit the site and not look at an aerial photo of it." 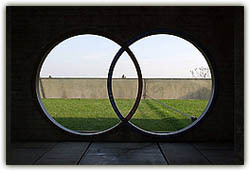 Technorati tags: crescent of embrace, flight 93 memorial, tancredo. "Cone-demned . 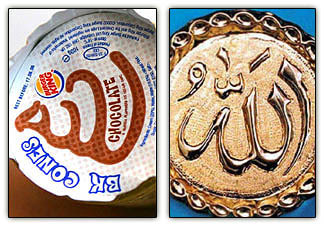 . . 'spinning whirl ice creams look similar to the word Allah written in Arabic script," captions a UK Sun report [via Dhimmi Watch] re a British Muslim's jihad on junk food. The man claimed the design resembled the Arabic inscription for Allah [turned one quarter turn to the right] and branded it sacrilegious, threatening a "jihad." The chain is being forced to spend thousands of pounds redesigning the lid with backing from The Muslim Council of Britain. It apologised and said: "The design simply represents a spinning ice cream cone." Designer Paul Murdoch said he is "somewhat optimistic" that the spirit of the design could be maintained: "It's a disappointment there is a misinterpretation and a simplistic distortion of this." Since the announcement of the Memorial design, we have welcomed Paul Murdoch and his team into our family and have had the opportunity to discuss this naming issue at length. We know this design was not intended to hold any religious undertones nor desecrate, as some have said it does, the memory of our loved ones. We strongly support this design and the design team. It was Paul Murdoch himself that mentioned to family members that refinements may need to be made to the design. We are supportive of his wishes, but remain steadfast in our support of it. We are confident in Paul’s ability to memorialize our loved ones. With our continued input and support, this memorial will be built. The most important lesson we can learn from the passengers and crew of Flight 93 is that positive action must be taken in the face of adversity. We must not be distracted, but instead remain positively focused on the acts of the heroic strangers who came together to avert a larger disaster on September 11. When completed, this Memorial will give us all a place to remember their deeds and offer the country a place of healing. We're used to seeing identity-politics leftists (the Larry Summers affair) and jihad-happy Islamicists (Allah in the ice cream logo above) using hysteria to cow their enemies. But it was a rude awakening in the last week to see respected opinion shapers from the right side of the aisle resorting to the same tactics without bothering to get their facts straight. 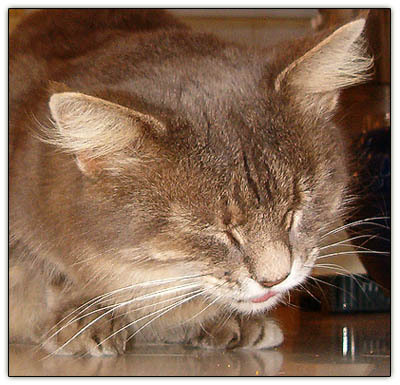 "Islam does not own the crescent moon"
Tiny gets into kibble treats -- Friskies Dental Diet -- after supper, her version of our own raspberry sherbet following award-winning Chelsea Baked Beans and franks on a bed of steamed cabbage. "It isn't Saturday night, and we're not in Maine. What's going on?" asked Tuck suspiciously. Keep 'em guessing, we always say. Talk about just desserts. Sandy Dahl, wife of the pilot of Flight 93 and board member of the group responsible for bringing the memorial into being, told radio talk show hosts Dan Caplis and Craig Silverman of 620 KHOW in Denver this afternoon why the memorial should go on as planned. Hats off to Michelle Malkin, who's been leading the charge against going on as planned, for having the guts to publish the link. It's just what we needed to hear, straight from the heart and mind of one of the principal players in the Flight 93 Memorial drama. According to a Pittsburg Post-Gazette profile, Flight 93 Pilot Jason Dahl (left) of Denver would have celebrated his fifth wedding anniversary with wife Sandy (laying flowers at the crash site one year later above), a flight attendant, on Friday, September 14, 2001. "To surprise his wife he planned to buy her a baby grand piano, a manicure and pedicure, and fix dinner for her and eight couples. On Sunday, the couple would leave for a three-day trip to London. In order to get that time off, Dahl and his wife agreed he would fly on Sept. 11-13." No one was thinking of Islam when they were making this memorial. I would love for Mr. Tancredo to visit the site and not look at an aerial photo of it. We put the site back the way it was except added our loved ones into it. If you want to find something evil in anything, I think you can, if that's what you're looking for. If I look up in the sky and see the crescent moon, I see the beauty of the moon. Islam does not own the crescent moon. This kind of reminds me of back in the 70's when you played a Beatles record backward and you heard "Satan." I think it's just paranoia, negative thinking that has no place on this site. It was a peaceful place before, and this is the way we want them remembered. We want this to go down in history that you stand up for what you believe and fight back and don't let people take you. This is what America is about. Now you're talkin'. Let's roll. Technorati tags: crescent of embrace, flight 93 memorial. Update: Friday Ark now loading at Modulator. "Irascible tomcat" Mr. Gato of enrevanche is first in line. The Washington Post is watching you. A new feature we just stumbled upon in our Site Meter stats: "Who's blogging?" (above image, lower right) links sisu and Michelle Malkin in a sidebar accompanying a story that both of us had linked to the other day on Tom Tancredo's entry into the "Crescent of Embrace" embrolio. We notice Technorati's there at the bottom of the list. A Technorati ad, perhaps? We like it. THIS POST ON TRAFALGAR brings to mind this column by James Lileks: "Now our memorials are muted things whose passive beauty often seems at odds with the events they describe." At best. UPDATE [linking to Michelle Malkin's post about bullying the architect into submission] : Some progress, here. Lileks's words brought Gettysburg to mind. We've never visited Gettysburg National Military Park. According to the NPS website, it "incorporates nearly 6,000 acres, with 26 miles of park roads and over 1,400 monuments, markers, and memorials." But in our mind's eye it is not the touchingly sentimental, old-fashioned memorials so much as the evocative and timeless landscape itself -- the "passive beauty," in Lileks's words, of its vast, empty battlefields -- that moves us to contemplate the human condition. Again to borrow Lileks's words, these "muted things" do not seem "at odds with the events they describe." 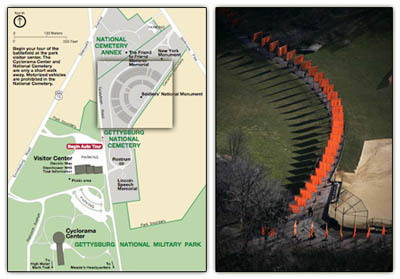 Gettysburg National Cemetery, (NPS map left) and segment of Christo's "The Gates"© (Wolfgang Volz photo) that wound their way through New York City's Central Park for 16 weeks last winter both feature the ubiquitous arc, an abstract shape often derived from existing landforms that is now at the center of a toxic blogosheric overreaction that has brought the unwitting principal architect of the Flight 93 Memorial project to his knees. Our own measured contributions to the "Crescent of Embrace" debate are available for your uninterrupted reading pleasure here. In our mind's eye we picture the magic of the morning-light-colored banners backlit by the sun and all the changing climatic effects throughout the sixteen days of the artwork's visitation. Everyday visitors quoted in various accounts seemed to get it while high-horse types of the right, enraged at the left's embrace of all things Christo, can't seem to see beyond their upturned noses. When fellow travelers on the right "lose their cool," reflexively trashing artistic brilliance without really looking at it in order to get their digs in at their political opponents, they are the losers. The Crescent Police may have won a battle by bullying architect Paul Murdoch into offering to "alter" his design [They "alter" tom cats, don't they? --ed], but in our view they ceded ground in the larger war of ideas by their tactics, seemingly having made up their minds long before gathering the facts and gratuitously smearing the designer in the process. 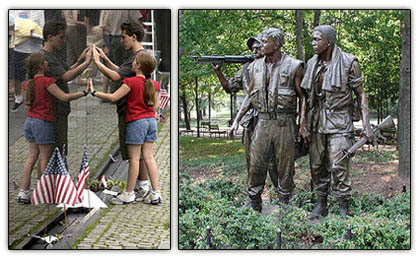 The Three Soldiers (right) by Frederick Hart caught us off guard two falls ago when we walked up the rise after taking in Maya Lyn's once controversial but now much loved polished marble Vietnam Veterans' Memorial Wall on the Mall in D.C., engraved with all the names of the war dead (left). Overcome with emotion as we followed the three soldiers' gaze back to the wall, we recalled our elitist disdain from years before when we first heard that the pristine wall would be "contaminated" by a realistic grouping. How wrong we were. The lifelike but universal soldiers breathe life into the cool, abstract wall with their humanity, and the wall, in turn, lends historical resonance to the immediacy and concreteness of the soldiers. The whole, never anticipated by individual planners nor artists, was so much greater than the sum of its parts. Landscapes are like that. Their evocative power grows over time. Nothing about this rather beautiful, beatific design reflects that courage and intrepidity. It instead insists on new-agey windchimes and areas of contemplation, which would have been excellent had the centerpiece of the memorial still recalled the valiant courage of the people who fought back instead of merely contemplated their fate. What do we have in place of that? A centerpiece that, inadvertently or not, invokes the religious symbol of the terrorists who used their religious fanaticism to rationalize their acts. We understood there was wind always coming across the site. The last contact that many families had [with the deceased] was through their voices, on cell phone calls. We wanted to do something with sound that somehow acknowledged that. Because the wind was there, we thought of wind chimes that would continue to resonate in the place and carry a living memory of the passengers and crew. And we found how important the sound was [at the site]. You can sit in the temporary memorial and listen to the wind go through the flags and walk through the hemlock grove and hear it in the trees. We wouldn't try to re-enact what happened on 9/11. We wouldn't try to reveal the violence of that. We always felt that story should be told in the visitors' center, the interpretive center. The memorial would be the place where all of that is contemplated and everybody would be doing that on their own terms and in their own way. "A proper war memorial stirs to anger and action," asserts Michelle Malkin in her latest column. Really? Name one. Every one we've ever visited or studied in terms of spiritual placemaking properly invites contemplation. We think that you and Michelle and the other leaders of this blogospheric attack on the architects' and landscape architects' motives owe it to us, your admirers and faithful readers, to give the designers a chance to tell their side of the story before giving in to what looks to us, from our own landscape architectural perspective, like a hysterical rush to judgment. Designer Paul Murdoch said he is "somewhat optimistic" that the spirit of the design could be maintained. "It's a disappointment there is a misinterpretation and a simplistic distortion of this, but if that is a public concern, then that is something we will look to resolve in a way that keeps the essential qualities," Murdoch, 48, of Los Angeles, said in a telephone interview. Some are insisting that the "topography of the land" dictates that the crescent remain. But several other finalists did not use a crescent or arc in their plans. Murdoch should give them a call. "Topography of the land" in scare quotes? 'Guess Michelle never took a grading course in grad school. After all, what better way to demonstrate your willingness to “embrace” your enemies than by erecting a giant Islamic crescent at the site of the day’s most unambiguous episode of American heroism? The “crescent of embrace,” in its desperation to see no enemies and stand for nothing, represents the precise opposite of Beamer, Glick, Burnett and co: Are you ready, guys? Let’s roll over. Whoa, big fella. Rousing, muscular prose as always, and we couldn't agree more about the idiocy of the name, but we're sorry to see that the otherwise totally awesome Mr. Steyn doesn't seem to have a clue when it comes to placemaking. 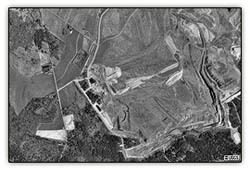 USCG aerial photo of the crash site in Shanksville, Pennsylvania (black vertical slit just to left of center near bottom of image marks the spot of impact). The site designated for the Flight 93 Memorial is at a very large scale, 2,200 acres. "It had been forested, it had been farmed, it had been mined and now it had taken this violent impact on 9/11. And it had been able to absorb all of this and still had its own tranquil power. And that's the level that we wanted to operate on," says architect Paul Murdoch. The very first sketches that we did were dealing with land forms. It was apparent right away that at the scale of this site, we weren't going to create a monument, a built object that would be able to make a heroic statement. And we wanted to make a heroic statement. We were going to have to use the land to do that. The land was somehow the key to creating a memorial here. Q. When did you first learn of concerns that some people were interpreting the open circle of red maple trees with the red crescent associated with Islam? A. I believe it was mentioned in the second stage jury report. Q. Did it occur to you in the initial design phase that this might be an issue? A. No, this is not in any way a derivation of what we came up with. I think it's an unfortunate misinterpretation of what we've generated, which we feel is very unique. The generation of this form came from the place and the intention of this memorial. We've received a lot of angry mail in response to our contrarian position on this raging controversy and were touched by the sentiments of one of our visitors, jegoing, who observed rather quizzically "I thought this site was slanted toward the conservative side?" Yes, but it's not an echo chamber.